We are a leading Manufacturer of cleaner / multi purpose cleaner 5 liter orange - refill and orange all purpose cleaner liquid spray 480 ml from Bengaluru, India. Packaging Details: Our all purpose cleaner liquid products can be packed as per the customer requirement and depends on the order details. ALL PURPOSE CLEANER – DESCRIPTION Most likely to use: NIXY all purpose cleaner, multi purpose cleaner, universal cleaner is very important antiseptic cleaning product which can be used for multiple purposes such for kitchen purpose, bathroom purpose, floors and surfaces, etc,. It cleans stains, spots, dirt and dust giving bright and shining surfaces. Secondary paragraph description: 1. To get the best results, use our NIXY antibacterial multi purpose cleaner liquid solution which is safe and non-toxic. It gives the surfaces a good polished look 2. NIXY concentrated and antiseptic multi purpose cleaner is a ph controlled product with some ingredients. It is a bleach free product and doesn’t not contain very harmful chemicals for the surfaces 3. NIXY disinfectant all purpose cleaner liquid is an all in one cleaner liquid with some essential oils which cleans off the grease, stains, spots, etc from variety of surfaces like stove, chimney, toilet, stainless steel, exhaust fans, floors, glass, etc,. 4. NIXY all purpose cleaner solution comes in liquid form placed in spray bottle and not in the form of powder, gel, foam, cream, etc,. 5. The formulation making of our NIXY concentrated and antiseptic multi purpose cleaning liquid focuses on high quality with economic cost. The details regarding the dish wash usage tips, uses, how it works, how to use, manufacturer details and other information is given on the label of our NIXY all purpose cleaner bottle / can 6. Our NIXY disinfectant all purpose cleaner liquid was not tested on animals nor pets. We have no indication for bug / insect repellent effect 7. Our NIXY concentrated multi purpose cleaner liquid comes in combo pack and refill pack. And these items can be availed at best prices in the pantry offers 8. NIXY all purpose cleaning liquid received good reviews on Amazon Where to use: NIXY disinfectant all purpose cleaner liquid can be used to clean kitchen, bathroom, electric chimneys, tiles, wood, glass, granite, microwave oven, television, hardwood cabinets, floors, drains, cabinets, exhaust fans, equipment, appliances, table, kitchen top, pipe, trolley, stainless steel, sink, etc,. NIXY concentrated and antiseptic multi purpose cleaner can be used at houses and industries such as; hotels, restaurants, hospitals, schools, offices, factories, etc,. Available fragrances: NIXY antiseptic and disinfectant multi purpose cleaner is available in orange blast fragrance. It comes in simple orange colour with mild fragrance. 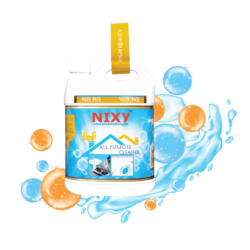 Available sizes: The concentrated NIXY all purpose cleaning liquid is available in different sizes; 480ml, 5 litre refill, 10 ltrs refill, 20 liter refill, 30 ltr refill, 50 kgs refill and 220 KG refill. And the following all purpose cleaner sizes are coming soon; 120 ML, 150ml, 200 ml, 250 mili litre, 400 mili liter, 450ml, 500ml, 600 ml, 650ml, 750ML, 828 ml, 900 ml, 975 ml, 1 ltr refill, 1.5 litr refill and 2 ltrs refill. Packaging Details: Our all purpose cleaning products can be packed as per the customer requirement and depends on the order details. Looking for All Purpose Cleaner ?